Cannonball provides a wide array of intermodal delivery services from all railroads serving the Omaha market, including BNSF, UP, and the Iowa Interstate. Our strategy is not only innovative, it’s incredibly effective – a model that gives you access to a fleet of over 32,000 of our own 53-foot freight containers, and over 90,300 rail assets. This brings you the most flexible and reliable intermodal shipping service operating throughout North America. Plus, we know the kind of personalized attention this requires. We can handle a variety of freight. From transporting hazardous cargo to using climate-controlled containers, we can match specialized equipment to your transportation needs. 24 Hour Operation Pick up and delivery of boxes to all container pools in the Omaha area. 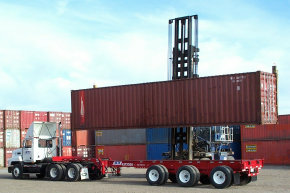 20 ft, 40 ft and anysizer chassis available for COFC moves. Handle domestic/international containers and boxes. Service to Iowa, Kansas, South Dakota, Missouri and Nebraska. Member of the UITA (Uniform Intermodal Transportation Association).